If you’re lucky enough to own an iPhone X at the phase of its sheer demand and limited supply, you might have experienced the excellence of the Super Retina Display. There’s no doubt that the panel on the device is top notch (pun intended). However, the notch at the top portion of the screen is not for everyone. While some might easily ignore it, others are easily distracted. For Apple, the notch was incumbent as it houses the TrueDepth Camera technology underneath along with a bevy of other sensors. Nonetheless, if it’s too much for you to ignore, developers have devised the best solution that you can adopt right now. If the iPhone X notch is distracting you from watching content on the edge-to-edge display, be sure to give the new app a swirl and let it do wonders for you. The app is called Notch Remover and it is available in the App Store. The app features a pretty straightforward design and does exactly what it is intended for. To clear the minor misconceptions, do take note that the app does not really remove the notch from the display, rather it simply places a black bar at the top portion. So let’s check out the mechanics of the Notch Remover app. While the notch on the iPhone X’s Super Retina Display is here to stay, the app basically allows you to camouflage it. As we have mentioned earlier, the app adds a black bar at the top portion of your iPhone’s display, blending the color to make you feel that the notch wasn’t there, to begin with. In addition to this, the Notch Remover app will also add a black bar to your images in the stock iOS settings page. A drawback associated with it could possibly be the fact that the usable display size would be reduced. However, this might not be that big of a deal for some users who are tired of being distracted by the notch. Moreover, it is currently the best option available for users and any other way would ultimately reach the same conclusion. 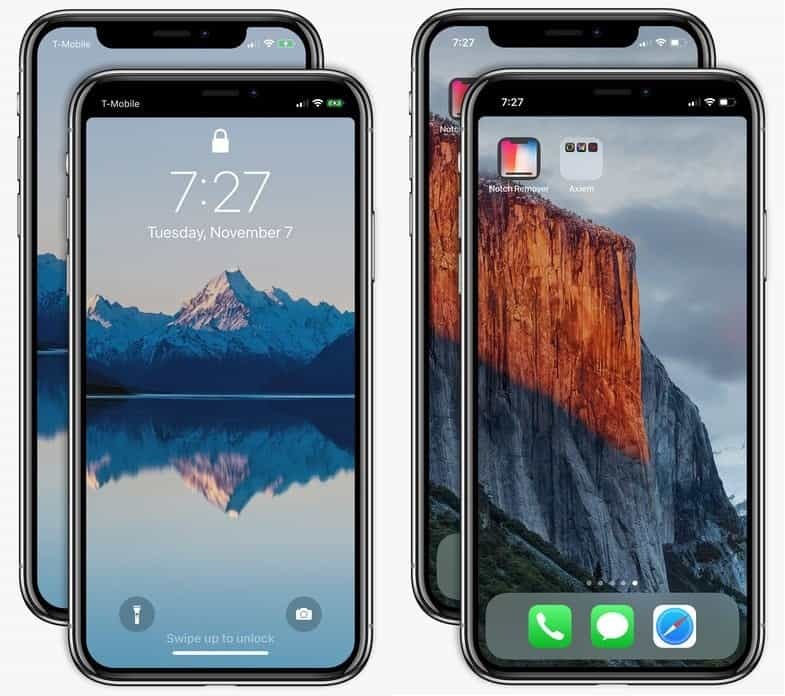 On the contrary, Apple approved the app even though its app developer guidelines for the iPhone X suggested that developers should not hide the rounded corners, housing sensors or the Home screen indicator by placing black bars at the top or bottom of the display. Nonetheless, it’s ironic for Apple to approve it. Moreover, the app comes with a price, but not that much to hit your wallet. Notch Remover for the iPhone X is available on the App Store for $0.99. So do check it out if you want the notch on your iPhone X to disappear (figuratively). This is all for now. Share your thoughts regarding the notch removal app down in the comments.